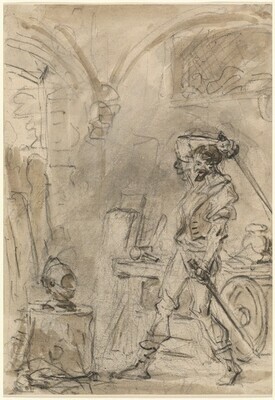 Probably Baron Dominique-Vivant Denon, Paris, by 1795, one of 19 Don Quixote illustrations by Fragonard owned by him (sale, Paris, 1826, no. 728 [the group]); to Delaunay. Lt. Col. E. W. Blunt Mackenzie, Castle Leod, Strathpeffer, Scotland (sale, Sotheby's, London, 26 July 1933, no. 91); The Hon. Irwin Boyle Laughlin, Washington, D.C.(not in Lugt), 1933; his wife, Therese Iselin Laughlin, Washington, D.C., 1941; their daughter, Gertrude Laughlin Chanler, New York; gift to NGA, 2000. Eighteenth Century Drawings from the Collection of Mrs. Gertrude Laughlin Chanler, NGA, Washington, D.C., 1982, no. 7. Drawings and Prints from the Permanent Collection (Summer 2000), National Gallery of Art, Washington, 2000 (no catalogue). Fragonard, Les plaisirs d'un siècle. Musée Jacquemart-André, Paris, 2007-2008, no. 72 (Marie-Anne Dupuy-Vachez). Portalis, Baron Roger. Fragonard. Sa vie et son oeuvre. 2 vols. Paris, 1889: 2:215, 299. Ananoff, Alexandre. "Alexandre-Evariste Fragonard et son père." Bulletin de la Société de l'Histoire de l'Art Français (1961): 155-157 (the series as A. E. Fragonard). Ananoff, Alexandre. L'oeuvre dessiné de Jean-Honoré Fragonard (1732 - 1806). 4 vols. Paris, 1961-1970: 4:no. 2667 (the series as A. E. Fragonard). Rosenberg, Pierre. Fragonard. Exh. cat. Metropolitan Museum of Art, New York, 1987: 499-500 (the series).